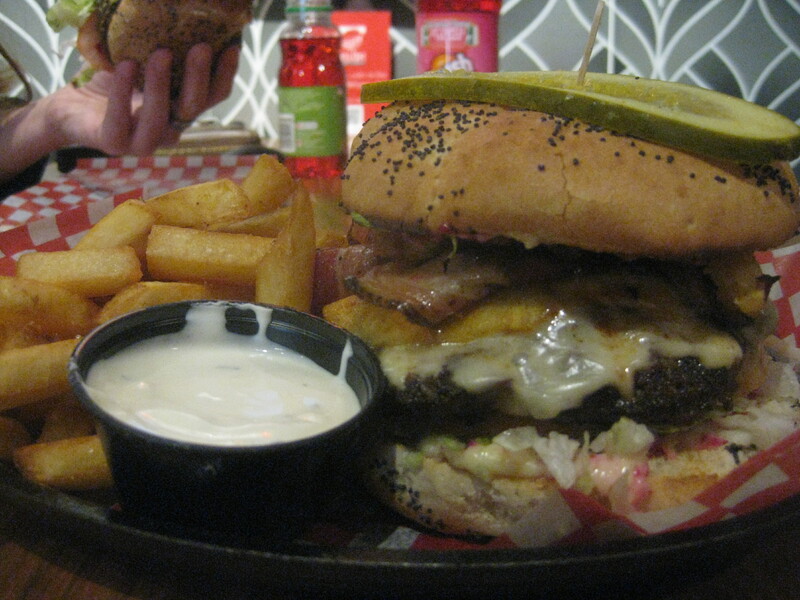 Welcome to the first entry of my Halifax Burger Quest! Here is how it’s gonna go down: I will be reviewing burgers from 3 different categories: Gourmet-Style, Pub Style, and Diner/Drive-In Style. I will also review the vegetarian burgers at each location. I don’t like numerical ratings, but I will eventually declare the winner and runners up. Originally, my intention was to order the most basic burgers on the menu, in order to make fair comparisons. However, I have found that ordering standard burgers does not do a good job of showcasing their potential. So I will be ordering burgers that represent more of the signature style of the restaurants. I am very excited to finally be starting this quest, so with no further ado, I present unto you, Relish Gourmet Burgers. 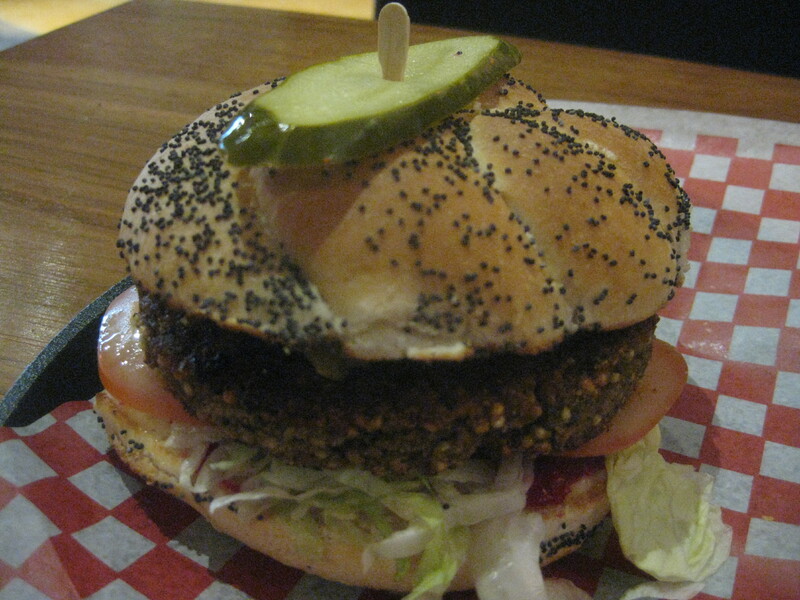 Relish is a gourmet burger chain originating in New Brunswick, and a recent addition to the previously non-existent Halifax burger scene. When we walked in, we immediately realized we had walked into a gimmick. We were greeted with a scripted “Welcome to Relish!”, which is kind of annoying, but I have to give the girl at the cash credit because her friendliness and helpfulness persisted beyond her script. The decor is also very “nice”; it’s clean, colourful, modern, and perhaps an indication of the ridiculous amount of money you’re about to spend on a hamburger. I don’t think there is ever an occasion to spend $20 with tip and tax on a burger platter. But if there was such an occasion, I would expect the beef to be local, grass-fed, free-range … hell, I’d want to be able to shake the farmer’s hand. Relish proudly serves fresh Angus Beef, but unfortunately, it is from Alberta. Other options include a veggie or ground turkey patty. The fries are produced by McCain and are enthusiastically marketed as “Atlantic Canada Fries”. Though frozen, they are thawed before getting dumped into the deep fryer, which gives them a crispy exterior and lush buttery interior. 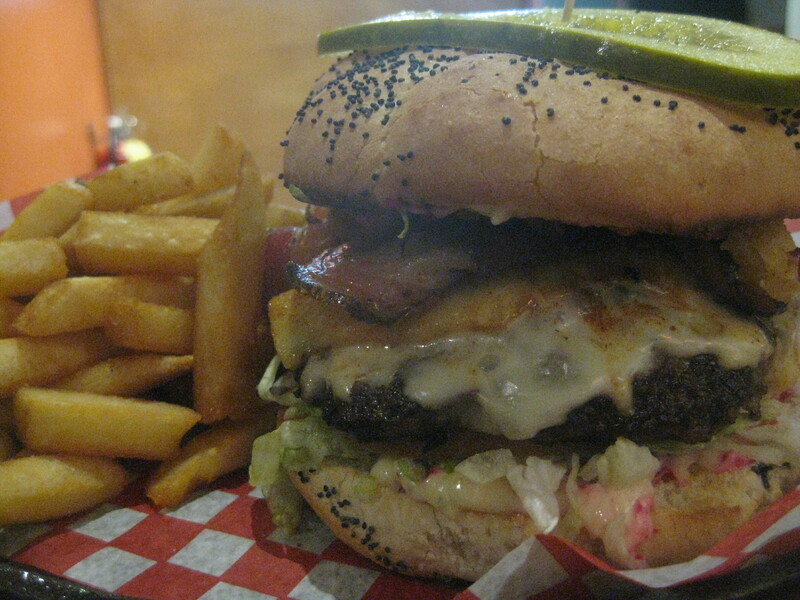 I ordered a burger unique to the Halifax location: “The Halifax Explosion”. 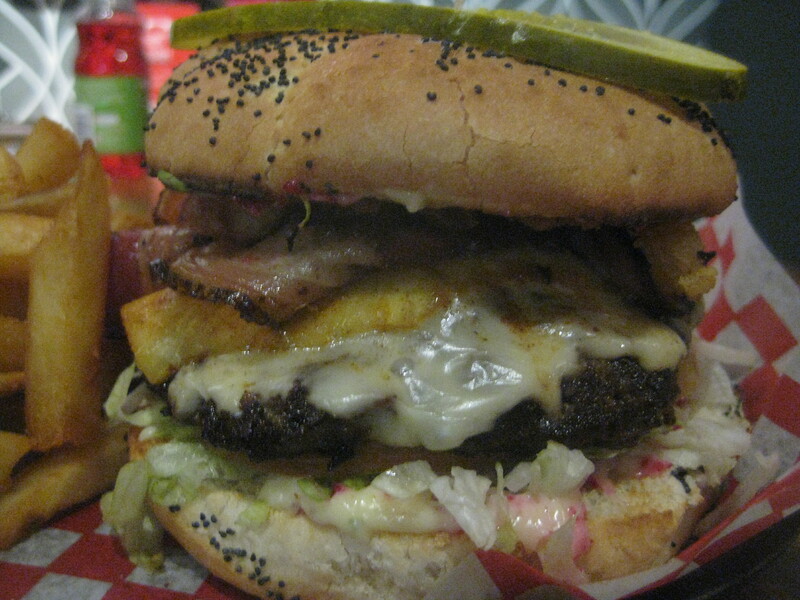 The Halifax Explosion features habanero pineapple, pancetta bacon, aged cheddar and curried onion frites. These toppings are in addition to the standard base toppings of shredded lettuce, tomato, roasted garlic mayo, and beet relish. 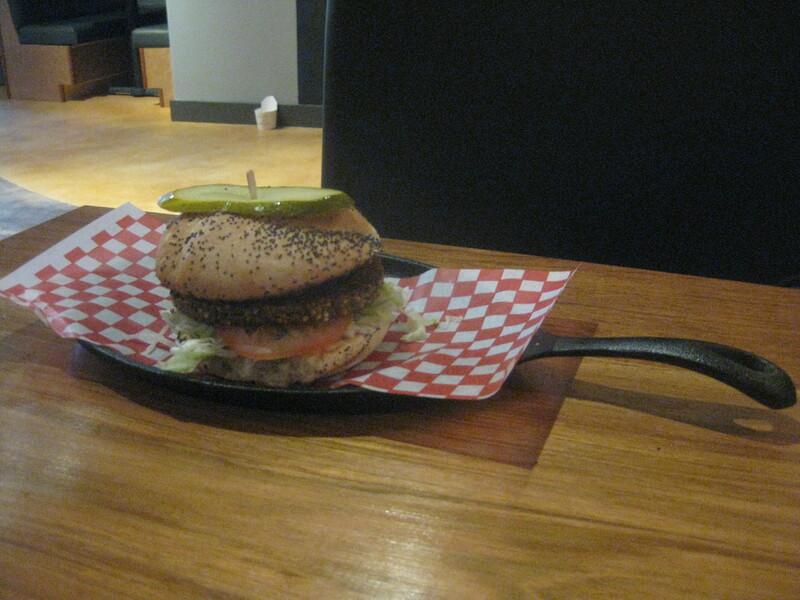 The burger is impaled by a wooden spike and topped with a pickle slice. The bun is sturdy and graced with poppyseeds. The patty is a little thin for my liking, but the texture and flavour of the beef are agreeable. I didn’t find it to be too overwhelmed by the toppings, which were lovely. Don’t be intimidated by the habanero; it is powder gently sprinkled on the pineapple and just gives the burger a pleasant kick. The onion frites contribute a nice crunch, although I couldn’t taste the curry. The fries were a huge surprise! They were perfectly crispy on the outside and the inside was something I could only describe as … poofy, like a buttery cloud of awesome! I’ve never come across French fries quite like these. Usually I would prefer that a restaurant make their own fries from scratch, but in this case I had to let the fries speak for themselves. And they did. Another cool thing about Relish is that you can get fry dippers for $1.50. I got the creamy goat cheese, but I also had my eyes on the curry mayo. I brought along my vegetarian associate, Brie (like-the-cheese), to help me rate the veggie burger. Other vegetarian friendly burger styles are the “Harvest Jazz” (blue cheese, havarti, caramelized onion, walnut pesto), “The Greek Tycoon” (feta cheese, marinated peppers and onions, kalamata olives, tzatziki sauce), and the Cabo Diablo (tomato jalapeno salsa, guacamole, sour cream, hot sauce). Overall, I was impressed with the service, ambiance, and food at Relish. I wasn’t particularly impressed with the price. 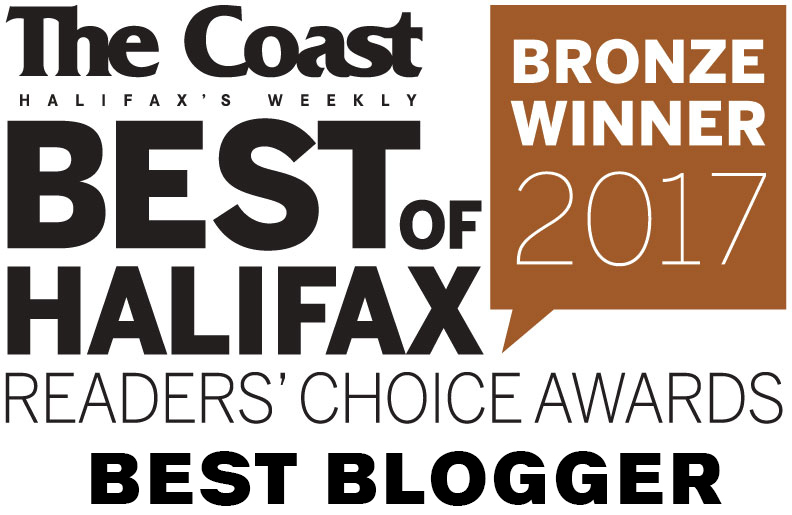 Stay tuned, and see how Relish Gourmet Burgers compare to the other gourmet-style burgers in Halifax! Great well written article. Made me hungry for burgers! Pictures great too! On a more positive note, I opened that bottle of port from Gaspereau Vineyards! Yeah buddy! You know my food adventures are always a good time! 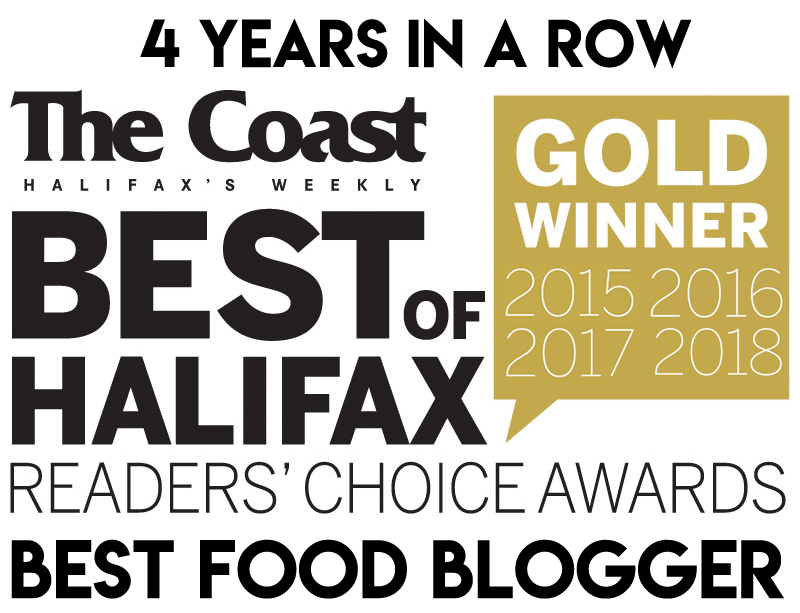 Brie you need to take your mother to Relish next time I’m in town….the halifax explosion looks amazing:) Interesting blog Lindsay!